A seminar was conducted for all teachers in school auditorium. The teachers participated enthusiastically and made the session an interactive one by sharing their thoughts and views regarding the current education system. They also put forward their suggestions in order to the improve the condition of the system. The seminar proved to be very helpful and interesting one for all. A special assembly was conducted by the students of secondary section on the start of the new academic session of year 2015-16. Various prayers and petitions were read out in order to ask blessings from almighty lord so as to make the year a successful one. The students promised to be punctual and remain in discipline so that they may excel in their studies as well as in co-curricular activities. Sr Helen, The Principal, wished students good luck for the year ahead. •	Annie Jain and Hiba Zakir donated 1000 Rs. each to the school charitable fund from the cash prize of Rs.8000 which they won in a debate competition held at JK Laxmipath University. As per the tradition of Sophia, the Initiation ceremony was organized on 30 April 2015 for the session 2015-16. Head Girl-Yakshita Soni and the other members of the student council were entrusted with their respective duties and offices. They pledged to abide by the rules of the school and do their duties loyally and diligently. The Head Girl delivered the speech promising on behalf of the Council to do all that is expected out of them. Deputy Head Girl –Manisha Ramchandani delivered the vote of thanks. In honour of those who make our lives easy by helping in day to day activities, Labours Day was organized on May 1, 2015. Various programs were organized for their entertainment and gifts were given as a token of appreciation for their work. The function organized by the school management was successful in its aim of putting a smile on the faces of our workers. The commerce stream students of class XII A & B, put up the stalls as part of their project work. The theme was “Earn while you learn”. The students used all sorts of sales promotion tools like advertisement, publicity and personal selling and sales promotion techniques like discounting, social media, and buy one get one free, premium offers etc. It was part of vocational training. This helped them understand business and management practically. From their profit they contributed 10% for charity. Thus, fulfilling their social responsibilities. The seminar was attended by Mrs. Vinita Sharma on Childhood Depression- Identification, Prevention and Intervention, organized be Institute of Counsellor Training Research and Consultancy. The institution is strengthening and enhancing school counselling for 22 years. In this seminar Dr.Ravindaran has given a session in which the emphasis was the child must imbibe ethics & empathy and must strive to become exemplary citizen. Movie : Don’t wait around for other people to be happy for you, any happiness you get you’ve got to make yourself. Entrepreneurship students of class XII, were showed the movie “The Pursuit of Happyness”,a rags-to-riches tale about love, family, and pursuing the Dream. The identification spirit, of the protagonist was remarkable and his positive attitude at the time of crisis leaded him to the transformation. Students related the movie with many everyday problems in the society. The resource person also provided students with concepts and approaches needed for entrepreneurship and motivated students to deal with worst situations. 23rd April 2015, Industrial Visit to Parle-G Factory Commerce stream students of classes XII A & B visited Parle-G biscuit factory at Ajmer as part of their CBSE curriculum in Business Studies. The group of 109 students learnt to apply the principles of management at work place. It was a life time experience for the students. The students were escorted by Mrs. Sunita Yadav and Mrs. Vinita Sharma. The young and enthusiastic players of the schools were awarded with medals and certificates for their active participation in sports and various inter and intra school activities. The ceremony was graced by Chief Guest , Rev.Bishop Oswald Lewis and Guest Of Honour , Mr.Sharma. Sapphire house was declared as the best house and Nandani was awarded as the best sports student. 45 KWP Solar Power Plant was installed on May 9, 2015. St Angela Sophia Sr. Sec. school was the first school in Jaipur . the occasion was graced by Mr. Krishna Kunal, IAS, DM Jaipur. BADE ADIEU TO Sr. Helen, the Principal and Sr. Vanessa , the Manager. The Sophian family bade adieu with heavy hearts to our dear Sr. Helen and Sr. Vanessa. The very air of Sophia was filled with emotions and each eye was filled with tears. After the summer vacation,the School reopened on 1st July,2015. The staff and students with great fervor extended a warm welcome to our new Superior Manager Sr. Sangeeta , Principal Sr. Ramona , Primary incharge – Sr. Fabina and middle Section incharge – Sr.Anisha . Special prayers and petitions were offered seeking God’s blessings on the management, staff and students. Time table making competition was held for classes VI to XII . Students show cased their creativity and came out with beautiful and artistic ideas. St. Angela Sophia hosted the “Holy Spirit Mass” on 7th July, 2015. The main celebrant for the Holy Liturgy was His grace Rt. Rev Bishop Oswald Lewis and was assisted by Priests of Catholic Churches of Jaipur. All the Christian students and Teachers of the missionary and convent schools participated in the Mass. After the Holy Mass all the students who outshore at the Diocesan level for Cathecism were awarded. Many students of our school won prizes. Bishop encouraged the students and showered words of wisdom to the gathering. Snacks were provided at the end of the programme. A seminar was conducted for the students of VI- XII on by our very own Ex- Angelite –Manpreet Kaur who is pursuing engineering from JECRC on MUN (Model of united Nations) on 22 July, 2015. The students were told about the benefits of registering themselves for MUN. Aavishkar Quiz series under Rashtriya Aavishkar Abhiyan as per directions of CBSE was conducted on 9 July,2015 for the students of class VI to XII . Its aim is to help in enhancing creativity and spirit of innovation. NCC Camp ATC was conducted at Satya Sai College, Jaipur. Seven cadets of our school attended the camp from 5th June to 14th June. Students of our school attended the 3 day yoga campaign. Three days Science camp was conducted at Manipal University. Students of class X participated actively in all the activities conducted. Jasmine Bhatti of class X was awarded as the best participant. Rajeshwari kalla of X C participated in the International English Olympiad and secured 23rd rank in state and international level. Mrs. Ruchi Gupta representative Proctor and Gamble company. A campaign in the school for the students of class VI & VII on the objective of the campaign is to make teenage girls aware about the physical and emotional changes they undergo during this period. The “Math club“of our school organized an Inter House Maths Quiz competition for classes XI and XII on 28th July, 2015. Emerald house secured the first prize and sapphire house secured the second prize. The management invited the parents of the students of classes IX and X to make them aware of the CCE (Continuous Comprehensive Evaluation) and the importance of Parenting. The resource persons explained the parents the methods to deal with present generation with love and affection. On 1st August,2015 few students of class XI and XII participated in the inter school Nukkad Natak competition held at seedling Public school and bagged the first prize. The International Institute of Hotel Management organized a cooking competition for the “Young Chef 2015”. Many students around the city participated in this event held on 1st August,2015. Mr.Naveen Vaishnav was the judge. 14 students of our school were selected among 850 students from all over the city. These 14 students participated in the next round and two girls out of them were selected for the final round. In the final round Umama Khan of class XII E was declared the winner. She was awarded with a cash prize of Rs. 30,000/- , a cutlery set and life time oppurtunity to represent Asia with 7 students from all over the continent in London. She gives all the credit to her parents and teachers. Mr. Manish Sharma and Dr. Rajesh Maloo , conducted a seminar on 7th August ,2015 to create awareness about shares , debentures and mutual funds among the students and teachers and alsoguided how to invest money. 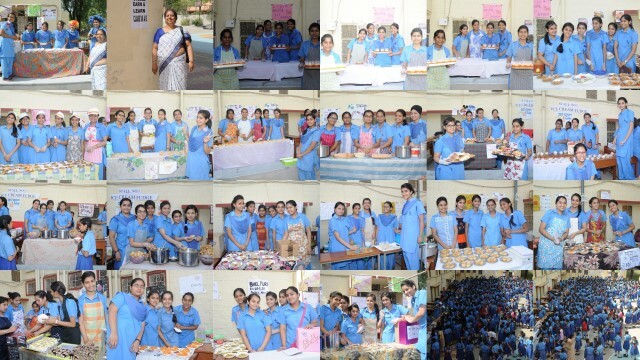 The ’Humanities Club’ of our school organized an inter school competition on 6th August ,2015. 12 schools from all over the city participated in various events with great vigour and enthusiasm. The judges appreciated the talents put forward by the students. Our Principal, Sr. Ramona encouraged the students with her words of wisdom. Mr.Pronoy Kapoor and Mr. Harshwardhan Soni of Turnkey Design solutionz, conducted a seminar on 8th August,2015 for the students of class X on the importance of textiles in daily life and career oppurtunities in designing . It enhanced the knowledge about textiles and gave them clear vision and opportunity regarding this field. The school conducted an inter class poster making competition for classes IX and X on 8th August 2015 with the theme ”Patriotism”. Each class was supposed to make two posters, one in english and one in hindi. Each section brought out their creativity and presented it wonderfully. The Aryabhatta inter school science quiz 2015was held on 11th August 2015. The theme of the event was “Nuclear Revolution :The Dawn of New Era. 24 prestigious schools of the city participated in it. The occasion was graced by Prof. k.R. Soni (Director of Bansal School of Engineering and Technology) and Dr. Aparna Dutta(Principal , B. Lal Institute of Biotechnology) as Chief Guest and Guest of Honour respectively .Various activities like Quiz, Debate and Poster Making were conducted and the students participated in it whole heartedly and brilliantly . Our school bagged the first prize. The function concluded with the inspiring words of our Principal, Sr. Ramona. Nandita Asnani of class VIII C of our school participated in the inter school Sanskrit poem recitation competition held at Neerja Modi School and won the second prize and Divya Gupta VIII B , Niharika Sondhi VII C and Satakshi Sharma VI D won the third prize in inter School Quiz competition held at Neerja Modi School on 13th August, 2015. To mark and develop patriotic feeling among the students for the nation, the school conducted various inter class competitions. Students of class VI participated in Fancy Dress Competition. Two students from each section dressed up like freedom fighters participated in the completion. Class VI C bagged the first prize and class VI D stood second. Students of class VII participated in the patriotic song which aroused the feeling of pride and love for the Nation. These competition were held on 12th August, 2015 . For classes XI and XII hindi and English speech competition was held on 13th August ,2015. Each class presented a wonderful speech which provoked the students to do something for the nation. Student of class XI D bagged the first prize in hindi and student of class XII C bagged the first prize in English. As usual, this year also the Sophian family celebrated the 67th Indian Independence Day on 15th August,2015 .Shri Jagdish Chandra , the head and CEO of ETV Rajasthan and Mrs. Arpita Jindal , the administrative officer in Indian Revenue Services graced the occasion as the Chief Guest and Guest of Honour . The tri-colour flag was hoisted followed by the National Anthem, They also inaugurated the 50’ inch LED presented by Shri Jagdish Chandra. A special prayer service was held commemorating the sacrifice made by the freedom fighters and praying for harmony, peace and prosperity of the Nation. A small cultural programme including patriotic songs, dances and speeches by students of primary and secondary as well. Sr. Ramona , the principal encouraged the students with an inspirational and patriotic speech. The English Club of our school organized the “English Excellence Day” on 21st August, 2015 with a motive of achieving mastery over language competency and effective communicative skill. The Chief Guest for the occasion was Mrs. Tanya Castellas, Principal St. Joseph’s School and Preeti Sharma, Associate Professor, Kanoria College as the Guest of Honour. The event unfolded with various competitions including Poetry Recitation Competition, Monologue Competition, Excellence Day Quiz. 10 Schools from all over the city participated in all the events with great vigour and enthusiasm. The Chief Guest Mrs. Tanya Castellas appreciated the efforts of students and the opportunity given by school to enhance all genres of English. The Principal, Sr. Ramona gave away the prizes, showered her blessings and praised all the schools that participated in the English Excellence Day and making it a huge success. The Teacher’s Day was celebrated on September 4, 2015 with pomp and show. The Sisters and students welcomed the teachers and pinned the badges. The programme began with the prayer service seeking God’s grace and blessing. The students from class H.K.G to class XII presented variety of cultural programme in form of dances , songs and skit to exhibit their love for their teachers. The members of students’ council felicitated the Sisters and teachers with beautiful tiara and cards as a token of love and gratitude. The students of class XII prepared a documentary as their tribute to the teachers . It was greatly appreciated by everyone . Sr. Ramona, the Principal appreciated the hard work of the teachers and wished that they continue with their dedication to the institution. Ma’am Jyoti Johnson , the senior teacher proposed the vote of thanks. The management Day also known as Exaltation of the Cross was celebrated on 12th September, 2015 to commemorate the dedicated services of our dear Sisters for the upliftment of the girls and society. The teachers and students welcomed them by pinning of the badges.The programme began by lighting of the lamp and prayer service. A wonderful cultural programme was organised by the students and teachers.The teachers and members of the student’s council presented flowers saplings and cards as a mark of honour.The teachers thanked them for their selfless and untiring service to humanity. Yashika Fauzdar off class VIII won the second prize at district level in back stroke under 17 category. She won 1 Gold medal and 2 silvers medal and was selected for the state level. Students of our school participated in the district tournament of badminton and bagged third position among 26 schools in under -19 category. 1. Saloni Sharma 2. Mahima Bissa 3. Vidisha Singhvi 4. Yugli Mehta 5. Anjali Bhatia. Stuidents under -17 category won the first position 1. Priyanshi Sajiv 2. Saloni Ambavani. 3. Kunika Jain 4. Jesmi Sajan 5. Rishika Agarwal. Priyanjali Sajiv bagged 1st position in Badminton Single’s and saloni Ambawani bagged 2nd position in under -17 category.